The MSG150 crew headed out today for the Szechuan Noodle Bowl but were let down by our first "Closed on Monday" sign. Unfazed and in strict accordance with unwritten sub-rule #1-1.B, we headed south on 8th to find the next spot. Based on early scouting reports of the MSG150 route, many of us had assumed that the next stop would be Specialties, but we were wrong. Although the S.E. border is the Gobi Desert of the DLZ, there is a pork bun filled oasis known as the Sweet & Fresh Bakery on 8th just south of Weller. We paused before entering to discuss briefly whether it passed rule #1. The consensus was yes, so in we went. I have a hard time holding this place to the same standard as our other lunch places - it's missing menus, silverware (or chopsticks), table service, napkins. On the other hand, as a stand-up take-out lunch place - not bad. Their options are limited to a bunch of meat buns, sponge cakes, and fruit tarts, with some submarine sandwiches available for special order. 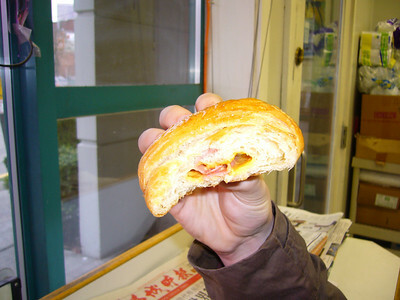 I wanted some savory, went for the ham/cheese croissant, and the pork bun. The ham and cheese croissant was greasy, and didn't seem like it was made recently, but altogether not bad. It was a little low on the ham and cheese, but was still consumable. The pork pot pie, on the other hand, was fantastic. I warmed it in the microwave for 30 seconds. 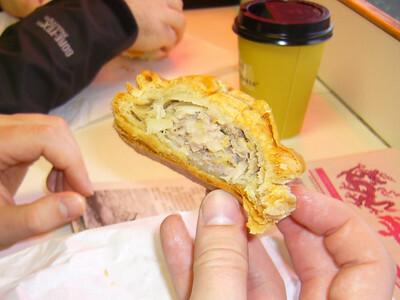 It had a nice flaky consistency, the pork was mildly spiced, shredded, filled the inside with some diced veggies. 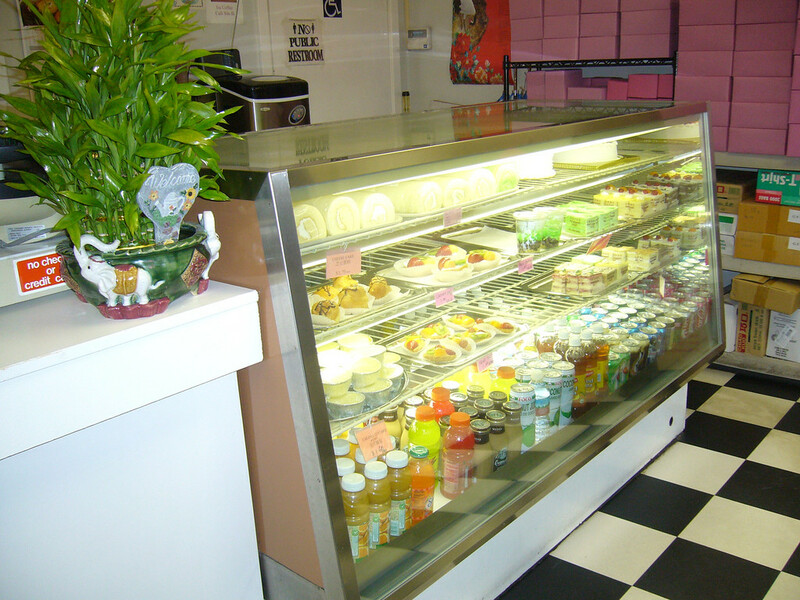 Pros - quick, clean, polite counter staff, some tasty baked options. Cons - lots of bread. Verdict - I might stop in if I was nearby but wouldn't make it special trip. Not quite a diamond, but this is definitely a precious gem in the rough. None of us knew that this place existed before we walked up to it this afternoon. I walked up to the counter, and ordered what sounded good. I ordered a BBQ Pork Bun (I'm sure it has a real name, but I don't know it), a chicken curry bun, and a submarine sandwich. I Started of by eating the BBQ Pork Bun. The bread was slightly sweet and pretty fluffy. The meat BBQ pork filling was good, but lacking. I wish the bun would have had about 2 times as much filling. The whole unit was served cold, and it definitely would have been better heated up. The next thing I ate was the Chicken curry bun. I spied a microwave behind the counter, so I asked the nice woman back there to toss my bun in her microwave oven. 30 seconds of modern technology improved the bun even more. Again, the bun was sweet and fluffy. The chicken curry filling is just what you would imagine... it was chicken curry. It was good. Then I started on the best part. This is a $2.50 submarine sandwich. 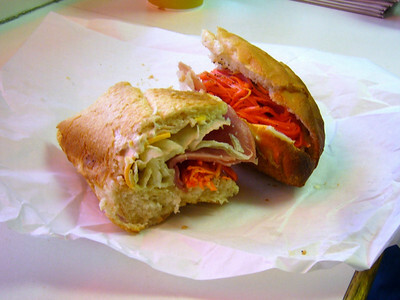 This is the American cousin of the "$2 Vietnamese sandwich." The sandwich was turkey, ham, iceberg lettuce, mayo, and pickled carrot shreds. Everything was pretty standard, but the carrots definitely gave it a really great taste. The real winner on this sandwich was the bread. It was crispy, flaky, buttery, and unbelievably delicious. I tried to buy some of the bread, but was told that they only make it for the sandwiches. Amazing Prices. Great food. Even better food. I'll eat here again. 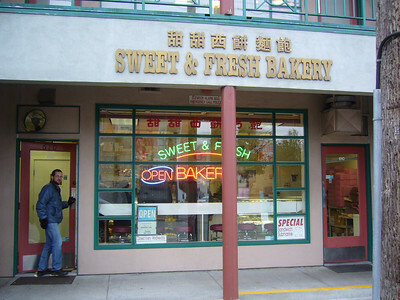 The Sweet & Fresh Bakery passed the letter rule #1 but only barley meets the spirit of the rule. Unlike the Sun Bakery with tables and a menu, the S&FB has only 6 stools along the window and no hot menu items. Besides the buns, cakes, and pastries in the cases they have only a submarine sandwich (with or without cheese) to offer the hungry lunch seeker. But, like other similar spots it was all good and affordable and the service (owner) was very friendly. I was curious about the meat pies so I ordered both. I ate what I assumed was the chicken one first. Unfortunately, it wasn’t until after I had eaten most of it that I realized there was a microwave behind the counter and if I’d asked, the friendly woman serving us would have headed it up. Even cold, the pie was very flavorful and the crust was light and flaky. The pork one, heated up, was even better, but other than being warmer, I couldn’t tell the difference. Maybe I got two chicken (or two pork) by accident. I also ordered the submarine sandwich with cheese. If there is a real standout at the S&FB, this is it. The sub comes on a freshly baked toasty baguette with fairly typical sub ingredients (ham, turkey, mayo, American cheese, and iceberg lettuce) but with one exception, it has a smattering of pickled carrots nestled between the cold cuts. Yum! This is the same stuff that (in part) gives the bahn mi sandwiches their tang. And, at $2.50 with cheese, it’s a much better deal than you might find elsewhere. 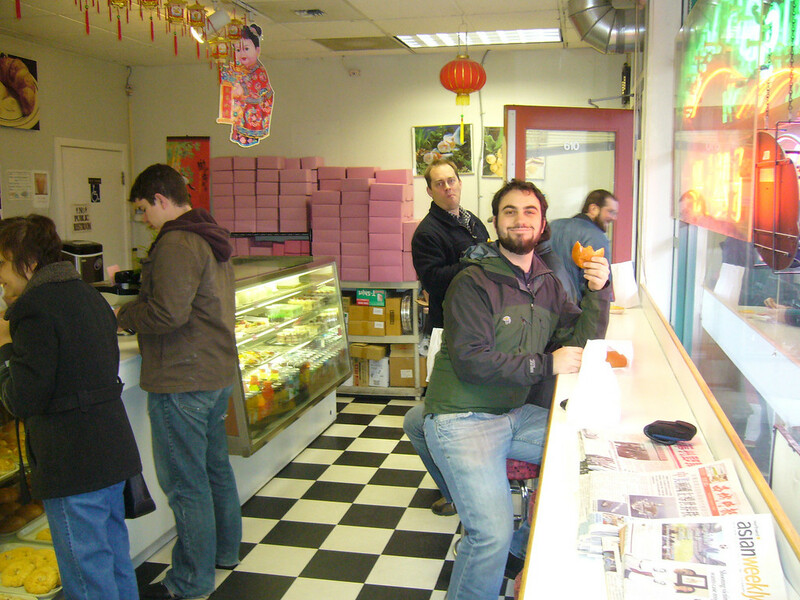 PS: Rob wants me to point out that there are no real vegi-friendly options available here other than sweets. You can see Rob in the pictures below ducking out of the door in search of some place that understands his kind. This is a hole-in-the-wall bakery – but surprisingly good. They have a variety of meat buns, perhaps 8-10 varieties, filled with bbq pork, chicken & flavors. 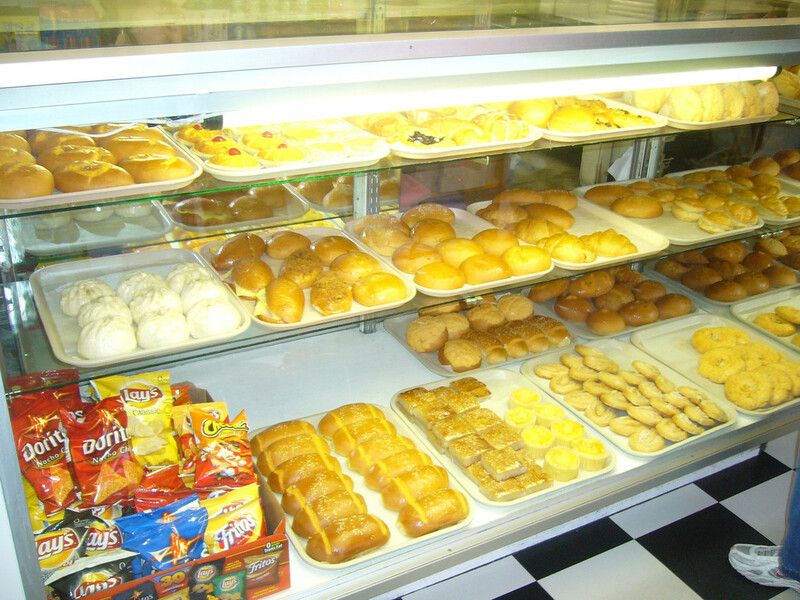 They also have a variety of baked goods. 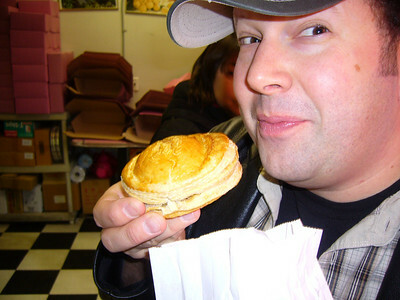 I had a bbq pork bun and a large egg tart for a grand total of $2.25 – for both items. The bbq bun was fresh, and the bun was every so slightly sweet and chewy on the outside. Meat inside was flavorful, although it could have been more filled, and I would have them heat it up next time. 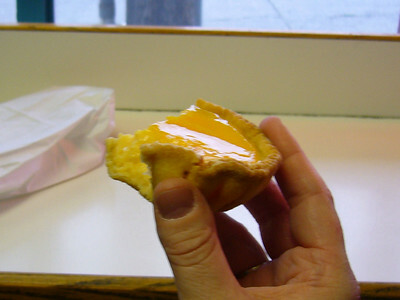 The egg tart/custard was about 2” across (twice as big as the ones you get for Dim Sum) and had a flakey crust with a good, smooth egg custard inside. I also had a taste of a fruit tart and a steamed bun with egg, Chinese sausage and meat inside. All tasted fresh. 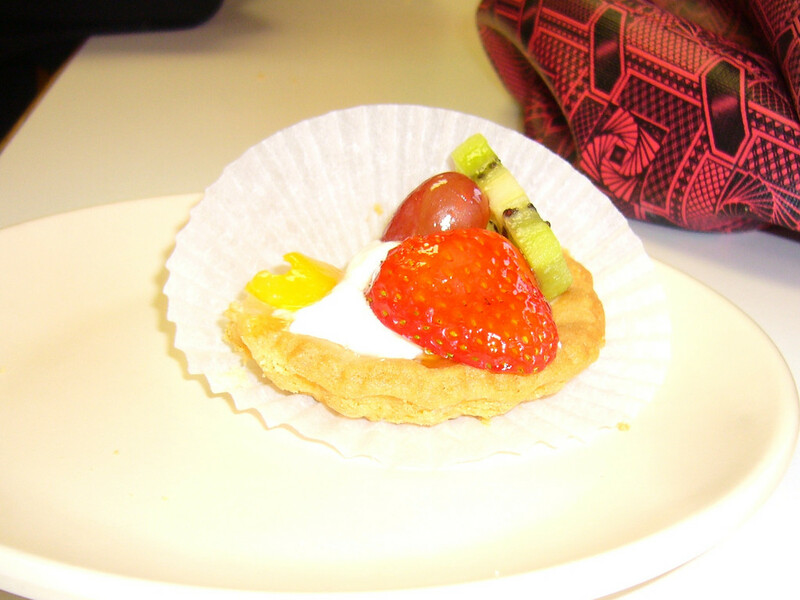 They had some interesting looking custards, cakes and cream puffs, and they also made traditional Chinese layer cakes – the kind that are light and fluffy, frosted with whipping cream and topped with fruit. I would return for a dirt cheap and tasty meat bun and a sweet treat. This earned a 3 chopstick rating from me. What's not to love about this little bakery? The have it all right here: Ham and cheese on crunchy fresh baked french rolls. Tasty bbq pork hom bow. Buns with red bean. Very tasty, very cheap, and ready to eat right now. And if you need a wedding or birthdcake they can do that too. This place is a keeper. I just made it back to this place to order one of their sub sandwiches. I couldn't find the sign that indicated sandwiches were available... so I walked inside to ask, and they still do. (I also later found their sign for sandwiches). I definitely want to reiterate how awesome the bread for this sandwich is. It's danged good. I haven't been in here in years, but we used to make a special trip to get coconut buns and a perogi type chicken filled bun. I am hoping I can find their phone number and will be visiting again as soon as I can. Love this place. See our kick-off post for details. 5 chopsticks: great! best of the ID. 4 chopsticks: good. worth a trip.